You don’t necessarily need to install a fence to create a private area in your back or front yard. You can plant trees or bushes that are tall and dense enough to form a privacy hedge. 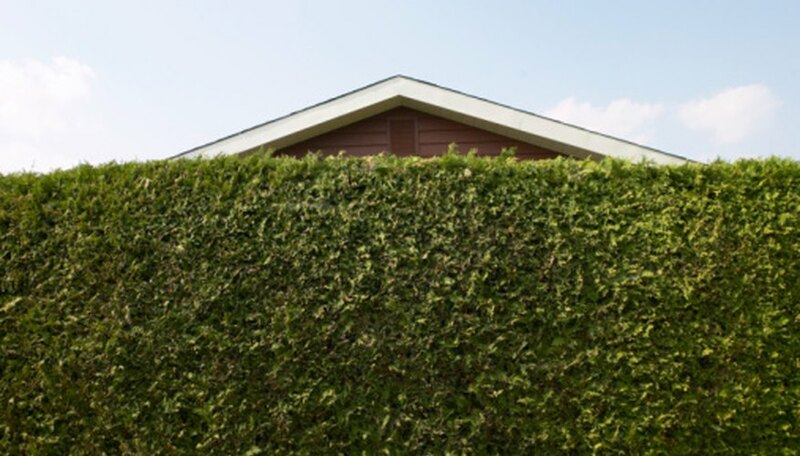 Privacy hedges are sometimes referred to as "Mother Nature’s fences." Thuja occidentalis, an arborvitae, is a wise choice for a privacy hedge because it keeps its shape without being pruned.Thuja will grow at least 6 feet tall, and it can reach to 15 feet at maturity. Don’t plant them too closely because this would stunt their growth. Plant them 4 to 8 feet apart, and eventually they will form a solid barrier. The farther apart you plant them, the taller they will get. Nellie Stevens Hollies are a good choice for privacy screens and hedges. They grow 3 feet each year and keep their deep green color year-round, even during summer droughts. Hollies can be neglected and still thrive. Plant them 5 or 6 feet apart to create a privacy fence. You can allow the plant to grow into a pyramid shape or you can prune it into a box shape. In the winter, red berries appear on the holly. Hardy privet hedge plants make a good privacy fence. They are the largest hedge plant in the United States, they live for a long time and they grow rapidly. This type of hedge is perfect if you like a symmetrical, formal look. You can trim these hedges into any shape you prefer. If you don’t trim them, they will grow to approximately 15 feet. When planting them, plant about 12 inches apart. A hardy privet hedge will grow in partial shade or in full sunlight. Another option is the Rosy Red Robin Hood Rose. This rosebush can grow as tall as 72 inches and does well in sub-zero climates as well as in hot weather. The roses are carmine and bloom half the year. Plant the bushes a couple of feet apart, and in a few years you will have a permanent fence created by the bushes. Forsythia bushes are among the first to bloom in the spring. The bushes are yellow and then turn green. A line of forsythia can create a privacy hedge. They grow very quickly and get as tall as 11 feet. Plant them about 4 feet apart to create a tight hedge. If you want a looser hedge, plant them 8 feet apart. Consider using hybrid willows to create your privacy hedge. They grow up to 20 feet in the first year, are disease-resistant, and are good sound and dust barriers. Willows can live and even do well in dry soil. They live for 70 years and might outlast you. Willows change appearance with the season. Plant the same variety in a row, and within two to four years the willows will be completely grown. iVillage Garden Web: What plants are good for narrow privacy hedges/screens?